Every spring for the last three years we have looked back at winter and thought that the inventory of homes for sale could never get lower than that again. Well it has gone lower once again! 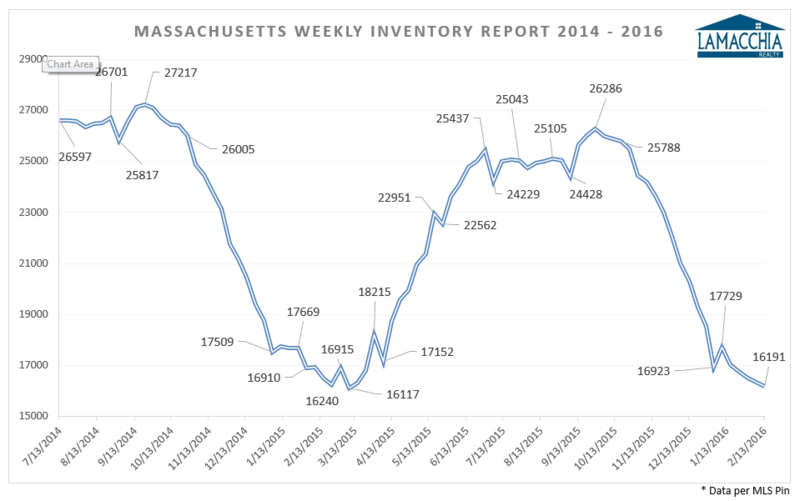 This past Saturday, inventory of homes for sale across Massachusetts, was lower than it was a year ago, which if you remember was the snowiest month in the history of Massachusetts. But why? Is no one listing their homes for sale? Nope! Actually, more people have listed their homes for sale between January 1st and February 15th this year (9,397) than the exact same time period last year (7,918) resulting in a 17% increase. First, we started the year with fewer homes for sale than last year. On January 1st 2016 there were 16,788 homes for sale compared to 17,320 homes for sale on January 1st 2015. That represents a 3% decrease. The second, and bigger reason, pending sales are way up. Year to date (as of February 15th) there have been 9,294 homes pending (accepted contracts) compared to 7,487 last year at this time. That represents a 24% increase. Early last month, we wrote a blog about how Listing in the Winter = Selling for more. It explained that when there are less homes on the market than there are buyers looking, buyers tend to compete for properties. This has happened every winter and early spring for the last three years. Since the first of the year, inventory of homes for sale has gone down every week because homes are going pending faster than additional homes are being listed. Inventory of homes for sale is very close to being at a 14 year low. The only time inventory has been slightly lower than it is now, was right after all the snow stopped in early March of last year. If you are selling your home this year and you want as much money as you can possibly get, you should list your property RIGHT NOW and take advantage of this supply and demand imbalance.